Of course, the security issue will remain: Iraq needs security watchfulness, as well as Syria and Lebanon, though in Lebanon, thank God, thanks to security cooperation (between Hezbollah and the Army) and to the efforts of the official security services, and their merit must be emphasized in this regard, we can say that ISIS has no more cells in Lebanon. The latest arrests have confirmed that there were no infrastructure, cells or (terrorist) groups, but only what they call lone wolves, individuals seeking to carry out attacks and acquiring weapons, explosives or knives, to attack the Lebanese army or some specific locations. Of course, this is a big setback for the security capacity of ISIS in Lebanon. I'm not talking about the Al-Nusra Front. But regarding ISIS (members), the worst, and I want to say it parenthetically, is that they are moved. Instead of being arrested for trial –we do not say that we must kill them all, but at least, arrest them and judge them–, the United States, who created Guantanamo after Afghanistan, what are they doing now? O my brothers, they are moving ISIS, they move ISIS from one location to another, from one place to another, with US helicopters. And you can see it all on video. Today, our region, our people, our armed forces, our security forces, our political will defeated ISIS in the region. But where is ISIS moved today? To Afghanistan, Pakistan, North Africa, Algeria, Libya, Tunisia, Egypt, Yemen... And this confirms the first point which I mentioned a few moments ago (the US is the main enemy of the peoples). Anyway, this year –for last year, we were talking about ISIS, and we have led the battle against ISIS (in Lebanon)–, we can say that this year, God willing, this (ISIS) project and presence will be finished once and for all in our region. For the next point, the Syrian issue, I have several things to say. First, regarding Idlib, the agreement that was reached to temporarily settle the situation there, in light of the discussions that took place, whether at the Tehran summit or at the summit held in Russia two days ago (between Putin and Erdogan), this result is a positive and reasonable one, provided it bears fruit. We will see what progress it will allow (we will judge on the performance). Ever since the summit between the Russian and Turkish Presidents was held, we keep being asked what is the position of Hezbollah. First, our position is linked to the position of the Syrian government. It is for the Syrian leaders to say that this or that thing is good and positive, they are the ones who accept or refuse. It is not for us to accept, reject or even describe (the agreements). But considering the situation objectively, and in the light of an objective reading of what is happening, we believe that this result is positive and reasonable, provided it bears fruit. We have said, for 7 years, in all our speeches, that wherever an agreement could be reached, it should be done. Wherever a reconciliation could take place, it should take place. Any reasonable man, wherever he can achieve his goals without casualties and effusion of blood, has to do so, or with the least possible casualties and effusion of blood, he has to do so. What happened is a step towards the political resolution (of the conflict). This is a positive and necessary thing in itself, but on condition that it pays off, as we have said, and that the terms of this agreement are scrupulously enforced. And of course, in the days, weeks and months to come, this will bring Syria into a new stage. The second thing about Syria is the question of the Eastern Euphrates controlled by Kurdish units, and it is related primarily to the US decision. Every day, the US say a different thing. Some time ago, Trump said that the US would withdraw from Syria after the end of ISIS, within a few months. Then a month ago, he said they would stay in Syria as long as the Iranians are there. Yesterday, Trump said they would reconsider things and get out (of Syria) soon, after the end of ISIS. It is not only that they have lost us, they may themselves be lost, O my brothers. Perhaps they themselves are lost (and have no clue what they'll do in Syria). Anyway, the question of the East of the Euphrates is linked to the US decision and the US strategy, and on this point, I renew my appeal to the Kurds: Do not rely on the United States. Your interest is to negotiate with the Syrian State, and to reach an agreement with him. Relying on the United States is a (huge) mistake because they can sell you on any market at any time. Third item on the Syrian issue: on the basis of the agreement on Idlib, if things follow their intended course and are enforced as they should, we can consider that Syria is heading towards a big pacification. Specifically, there remains no real battle front in Syria. Yes, we must remain watchful to the presence of ISIS and with some intermediaries, because we should not trust those who plotted against Syria in the past (Turkey, etc.). And today again, the question of the presence of Hezbollah in Syria is raised again strongly. I answer quickly that we will stay there even after the agreement and the calm in Idlib. Our presence in Syria is linked to the needs and consent of the Syrian leadership. I have said in the past that no one could get us out of Syria, but we do not pretend to impose our presence on the Syrian State. As long as the Syrian government will tell us that he needs us and wants our presence, we will stay. Certainly, the peace on the fronts and the decline of the threats will naturally influence the size of our forces in Syria. The fact that our numbers increase or decrease depends on the responsibilities, challenges and present threats. But as to our presence itself, we will stay in Syria until further notice. I say this to silence all the speculation (about our departure). The next point on Syria is the continuous Israeli aggression against Syria –the last one occurring just a few days ago in Lattakia–, under various pretexts. And I tell you with my usual frankness that many times, these pretexts are plain lies. 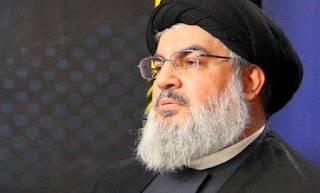 For example, when Israel claims that in Lattakia, they hit such base, such place, such research center, etc., to destroy weapons that were to be delivered to Hezbollah, it is a lie. This is not true. In some places, it is (indeed) about transfer of weapons, and they know what they are talking about. But many Israeli attacks have absolutely nothing to do with this issue. I'll tell you what this is all about. This is because Israel now has the certainty that the US-Israeli-Saudi project in Syria failed, that there is no way back: it is truly over. Just a few weeks ago, [Avigdor] Liberman spoke of the fact that the Syrian army had regained all its strength and health, and would become one of the most powerful armies in the region. Now, no one is here to defend Israel anymore, neither the armed groups in Quneitra and Deraa, nor anyone in the region. And facing the recovery and reconstruction of Syria, and the restoration of the Syrian army in all its capacities, Israel, as they declare it themselves through their leaders, needs to defend itself alone, all by itself. And that is why Israel (will work) to prevent a strong Syrian army to stand (against it). Israel (strives) to prevent a real Syrian military force to stand, and knows well that the strategic balance with Syria, since the time of the late President Hafez al-Assad, and up to the time of President Bashar al-Assad, is not (set) via the Air Force, or via aircraft weapons, but via what Syria has or can acquire in terms of missiles. Israel works to prevent Syria from owning a missile power. It is not true to say that what is bombed in Syria is what is intended to be transferred to Hezbollah in Lebanon. Israel knows that if the Syrian army and Syria acquire a (real) missile power in quantity and quality, it will create a balance of deterrence and will end the unremitting Israeli aggression. It may also have a psychological aspect, about revenge. But the real vision of Israel is the one I just mentioned. Iran is a pretext. Hezbollah is a pretext. But the real target is Syria. And that is why I wish to state that the Resistance Axis will pay particular attention, after all that happened, to (develop an adequate response) –I will not make specific threats today, it will come in due time– but I consider that the perpetuation of this situation is untenable and unbearable, and we need to find a way to end this Israeli aggression once and for all. And let me emphasize particularly the responsibility of Lebanon in this issue. Israeli planes bomb Syria, Damascus airport and Syrian cities from Lebanese airspace. Lebanon sometimes issues official statements denouncing (these violations of its sovereignty). Where is the complaint to the Security Council? We need a complaint, even if it does not lead to anything. But make a formal complaint, be it only to register an Israeli aggression against Lebanon. But the question requires more than that. The question requires more than (mere complaints). We must also develop a solution to stop these daily violations of Lebanese airspace, whether to attack Lebanon or Syria. Put three question marks and some exclamation points (after this question that requires an urgent response). In all truth, this needs to be thought about and studied, and requires a firm stand. I conclude on the Syrian issue with the refugee problem. Regarding refugees, after the experience led by Hezbollah (who helped refugees in Lebanon to return to Syria), and in which the Lebanese General Security has followed suit, I wish to state that yes, every day, it is proved that there are (Western) countries that encourage Syrian refugees not to return to Syria. (They encourage them) not to go back, and scare them (to keep them out of Syria). And there are also regional countries that encourage them not to go back and frighten them (for their safety if they return to Syria). And that is why we must work even harder (to repatriate all Syrian refugees). Although the number of Syrians (refugees in Lebanon) who have returned so far amounts to several thousands, this is little compared to the number of Syrian refugees in Lebanon. Parenthetically, I would also like to ask the (adverse Lebanese) political forces, because we are talking about voluntary, safe return: does failing to encourage refugees to return serve Lebanese national interests? Is it in the national interest of Lebanon on the issues of security, economy, finance, electricity, health? Of course (their stay in Lebanon) is not in our interest. Therefore, in whose interest are you doing this (discouraging Syrians to return home)? Anyway, on our side, we will continue this action (to help Syrians to return home). See what we were accused of in the past, and of which we are still accused today: the Syrian State and regime have been accused of wanting to change the (confessional) demography of the Syrian population. Iran has been accused of wanting to change the (confessional) demography of the population in Syria. And we (Hezbollah), we were accused of wanting to change the (confessional) demography of the population in Syria. O my brother, these parties, these countries and regimes that are accused of wanting to change the (confessional) demography of the Syrian population call every day the Syrians to return to their towns, villages, houses, fields and farms. Even in Qalamoun, there are reports of such things that are false. Even regarding the city of al-Qussayr and the surrounding villages, the situation will soon be resolved, God willing. All the developments are going in this direction with the Syrian government. O my brother, we are accused of wanting to change the (confessional) demography of Syria, while we spare no effort in calling all Syrians to return home. I call God to witness, who wants to change the demographics in Syria and Lebanon? Is it us and the Syrian state, or is it the States and Lebanese political forces who seek to prevent refugees from returning to Syria, who scare and terrorize them, etc., etc., etc. ?